SHERLOCK: A STUDY IN PINK #3 Review @comicstitan | Warped Factor - Words in the Key of Geek. Really, there’s no reason for this to happen. The first two issues of the Sherlock comic-book, giving us the first couple of chunks of the TV episode A Study In Pink, were practically word-for-word transcriptions in at least a vaguely Manga style, in black and white, and they engendered a sense of slight pointlessness by their doggedly accurate recounting of the episode’s incidents and dialogue. So why should issue #3, which does exactly the same, suddenly grab our interest? We’ve read it a couple of times now, and it remains somewhat enigmatic, but the fact of the matter is that even though we know exactly what’s going to happen and in what order, issue #3 feels significantly more ‘worth it’ than either of its predecessors. The artwork is for the most part in the same style, but there are some interesting takes on some of this issue’s scenes – Mark Gatiss’ Mycroft has had something of a makeover, looking rather more like the image he was probably going for, a kind of John Steed suavity and silhouette, with the unmistakable hint of ‘I could kill you in seventy-three different ways without breaking even the idea of a sweat.’ In essence, he looks rather more like Sherlock than Gatiss looks like Cumberbatch, giving a pleasing sense of familial similarity. There’s what feels like an extra heavy grain to some of the architectural sequences too, cars shiny and dark, panels of contrast between darkness and the beam of headlamps very vivid and almost shocking, shots of Baker Street with the street sign inset especially gritty, making the world feel more real than it has in the previous instalments. Being translated from the original Japanese comic-books of course, we still get the quirky fun of reading the story from right to left, but of special interest this time out, there’s an increase in the number of stage directions outside the panels themselves, where the art seems to concede it can’t deliver or where lettering would clutter up the panels. So you get directions like ‘Nod’ when Watson’s agreeing to something, and the rather adorable ‘Clack, clack, clack’ of Mycroft’s umbrella as he leaves his first meeting with John. It all makes for something you wouldn’t normally get in a Western comic-book, which is itself a reason to be interested in this one. 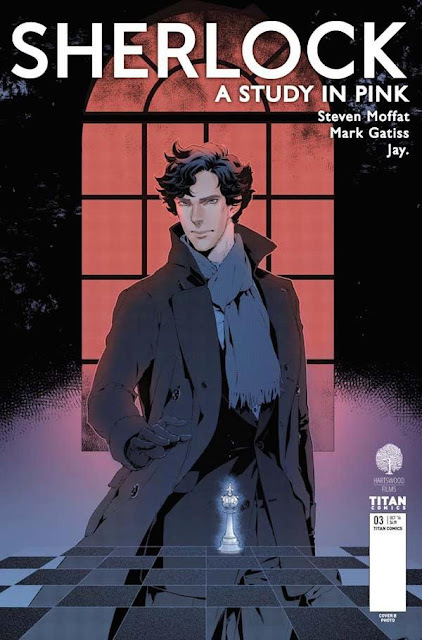 Perhaps the sudden upsurge in curiosity-hooks in this issue has something to do with the point in the story that’s shown here too – we go from Watson’s meeting with Mycroft through to Sherlock and Watson leaving to track down the killer after he’s rung John’s mobile, a section which gives us dark corners, shady meetings with arch-enemies, (literal) case breakthroughs, allowing Sherlock to display both his intellect, his sociopathy and his colossal focused energy, and of course Watson coming face to face with the fact about himself he hasn’t wanted to face before – that he’s not suffering from after-effects of the war, he’s craving that danger. As a moment, that worked well on screen, but if anything, it works better in the comic-book version because there’s time, there’s your own breathing space to take it in and process it, rather than being, as it almost seemed on screen, another example of the parlour-trickery of deduction. The enigmatically named Jay, who adapted the first episode of Sherlock into comic-book format, seems to have a love for the subject-matter, and as we’ve said in previous reviews, the appeal of the series in its original Japanese is easy to understand – Sherlock in one’s native language must be a thing to treasure, given the complex dialogue-burden and the speed with which that dialogue’s delivered. Certainly for the re-translation back to English, the script by Moffat and Gatiss is faithfully rendered, but for the first time in this issue, possession of a black and white, two-dimensional version of the story makes sense for non-completists, giving, through that black and white nature, the sparse, thin lines of its delineation and the smudging of beyond-focus backgrounds to allow the attention to be drawn to very specific speakers or elements, a visual analogy of the way Sherlock probably sees the world – the ‘battlefield’ concept introduced in this issue by Mycroft. For the first time, we get the sense (confirmed in later TV episodes, when it’s revealed he’s probably jettisoned the knowledge that the Earth goes round the Sun), the idea of Sherlock seeing the world in a very canine, bloodhound way – black and white, nothing beyond what’s important in focus, but with more than usual human perception filtering into his assessment of what can be classified as important, meaning his world is both broader and narrower than that of the average human at the same time. Probably, that’s what makes this issue feel more worthwhile than the previous two – the synthesis of the concepts introduced, like the battlefield of the world, and the visual representation of Sherlock’s view of it (whether, as we rather suspect, that’s an accidental correlation or a deliberate one). 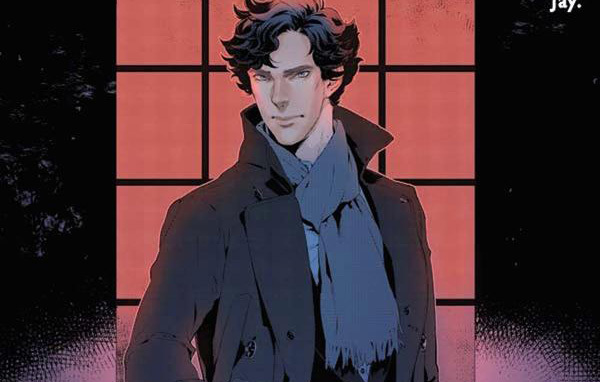 So – one to pick up, issue #3 of Sherlock. And of course, it is in the geek nature not to have an isolated issue of anything, so, given that issue #3 has rather neatly proven the point of its existence, it’s probably time to go back and pick up the first two issues as well.